KT Ichimoku Trader is a fully automated expert advisor that offers five popular trading strategies based on the Ichimoku indicator. Each strategy has it's own entry and exit method without any interference to other strategies. The Ichimoku system can be applied to all major currency pairs and metals. However, we found that it performs reasonably well mainly on three pairs. Trade up to 5 famous trading strategies based on the Ichimoku. Comes with 4 advance trading filters that can be fully customized. Inbuilt algorithm to fire trades only in the direction of trend. Possible to place the SL, TP and Trailing either in pips or the volatility coefficient. Comes with proper money management and loss avoidance module. Five popular trading strategies based on the various Ichimoku elements. Each of the strategies has it unique entry and exit point without any interference to other strategies. 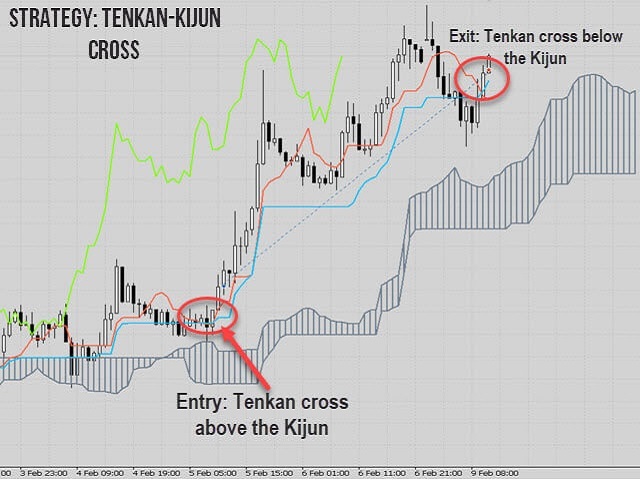 Buy Trade: When Tenkan-sen cross above the Kijun-sen.
Buy Exit: When Tenkan-sen cross below the Kijun-sen.
Sell Exit: When Tenkan-sen cross above the Kijun-sen.
Buy Trade: When price close above the Kumo cloud. Sell Trade: When price close below the Kumo cloud. Buy Exit: When price close below the Kumo cloud. Sell Exit: When price close above the Kumo cloud. Buy Trade: When price close above the Kijun-sen and Kijun-sen is above the Kumo. Sell Trade: When price close below the Kijun-sen and Kijun-sen is below the Kumo. 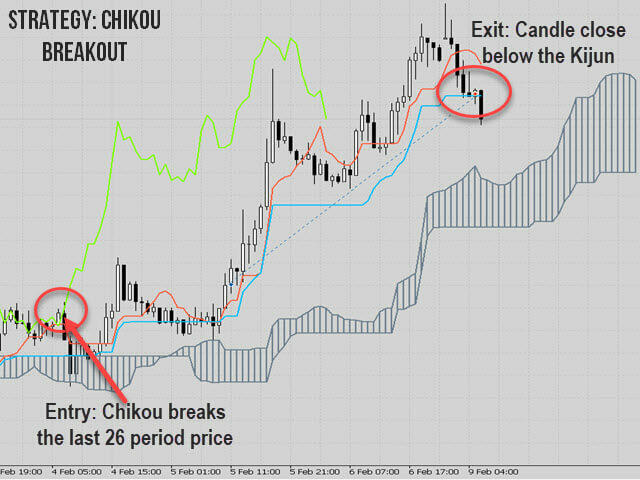 Buy Exit: When price close below the Kijun-sen.
Sell Exit: When price close above the Kijun-sen.
Buy Trade: When Chikou breakout above the range of last 26 period price. Sell Trade: When Chikou breakout below the range of last 26 period price. Buy Trade: When Kumo in future turns bullish i.e. SpanA cross above the SpanB in future. Sell Trade: When Kumo in future turns bearish i.e. SpanA cross below the SPanB in future. Buy Exit: When future Kumo change the direction or Price close below the Kijun-sen.
Sell Exit: When future Kumo change the direction or Price close above the Kijun-sen.
Is Hedging Allowed: If false, EA will not open opposite positions on the same pair. Tenkan-Kijun Cross: Enable/Disable the Tenkan-Kijun cross strategy. 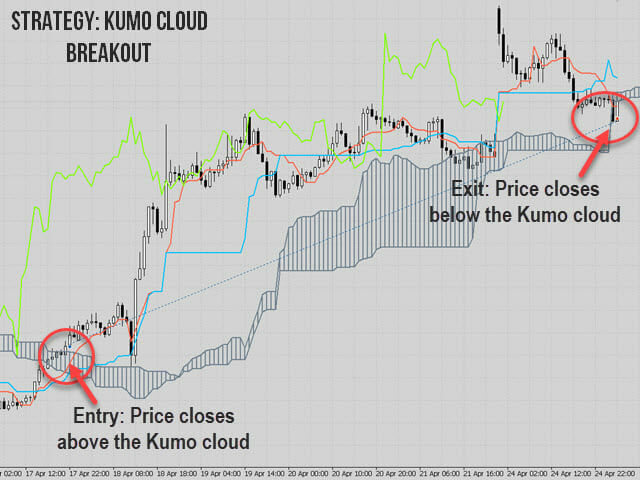 Kumo Cloud Breakout: Enable/Disable the Kumo Cloud Breakout strategy. 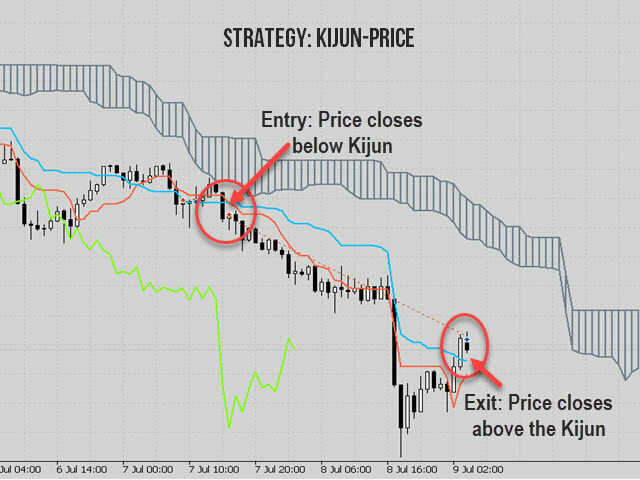 Price-Kijun Cross: Enable/Disable the Price-Kijun cross strategy(it is also the least recommended strategy compared to the other Ichimoku strategies). Chikou Breakout: Enable/Disable the Chikou Breakout strategy. 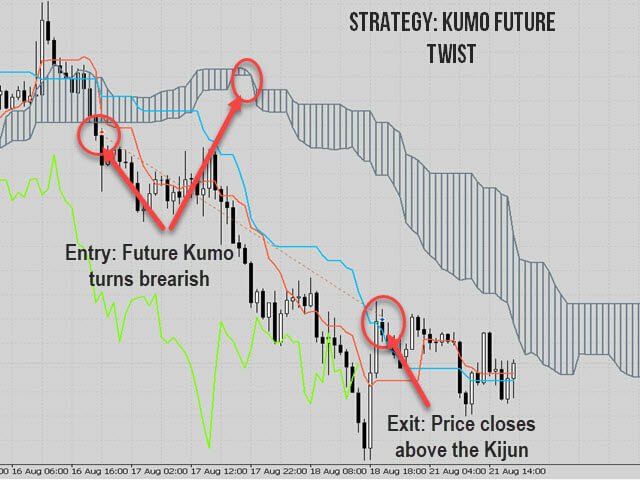 Kumo Future Twist: Enable/Disable the Kumo Future Twist strategy. Trading Session: Choose the appropriate trading session from the list. Volatility Filter: If true, the EA avoids new positions during the period of high or low volatility (depends on the chosen volatility coefficient). Vortex Filter: This filter distinguishes the price movement into two positive and negative oscillating lines. A long position is preferable when the positive line is above the negative line and vice versa. Max. Loss Protection: If true, the EA will stop trading when the total loss becomes more than the maximum Loss Limit set by the user. Logging: EA logs it's operation details in the journal tab.